Modern convenience makes it easy to go to the store and buy a pair of pants or drop a jacket off at the tailor for last-minute adjustments the night before a party. Unfortunately, convenience makes it just as easy to forget our most basic skills, like how to bake instead of buying, make preserves from your own kitchen, and how to know your way around a needle and thread. Knowing how to sew allows you to fix and make your own clothes, bags, pillows and comforters. It opens the world to basically anything that’s held together with thread. The same skills you use when sewing together clothes also apply – to some degree – in knowing how (and when) to stitch together a wound. Sewing has its entirely own lingo and you’re bound to encounter sewing shorthand when reading patterns. For example, CF means Center Front, CB means Center Back, RST means Right Sides Together and SAL stands for Sew Along. You can find a handy list of sewing abbreviations from SewingMamas.com and a comprehensive sewing glossary from Sew4Home.com. Fabric stores generally have a section reserved for patterns, and there are some great topical and seasonal pattern books for sale. Ask your local store for their catalogue. You can also head online for some free sewing patterns and have them printed at your nearest copy shop. Check out So Sew Easy, All Free Sewing, Sew Magazine and How to Sew for starters. You can also print your patterns from home, but keep in mind that the image will have to be of a high enough quality not to distort when printing. You’ll also have to adjust for scale (since you are likely printing on standard sized pages) and make sure the margins aren’t cut off and don’t overlap. Do this by opening the image in an image editor, clicking print and then going to “page setup”. While we’re on the topic of scale, you might have to increase or decrease the size of whatever you’re making from the pattern. The technical term for this is “pattern grading”. It’s not as simple as just making something bigger or smaller, at least unless you want the end-product to look like pants made for a stilt-walker. There’s more information about pattern grading in Threads Magazine and on Craftsy.com. You will need to re-trace the pattern: For this (and plenty of other sewing tasks) you will need a well-lit area, a flat and level surface to work on, tracing paper, a decent carpet knife, and a pair of scissors. Remember to protect the surface under the pattern when using the carpet knife. Always have several types of thread in several thicknesses and colors in your sewing kit. Different types of thread will apply to different jobs. Keep in mind what type of fabric you’re sewing. For example, thicker, harder, and heavier fabrics (like leather and denim) will require a thicker thread. You also have the choice between several types of thread, including cotton, polyester, nylon, linen, silk and several others. Ask a veteran sewer if you aren’t sure. 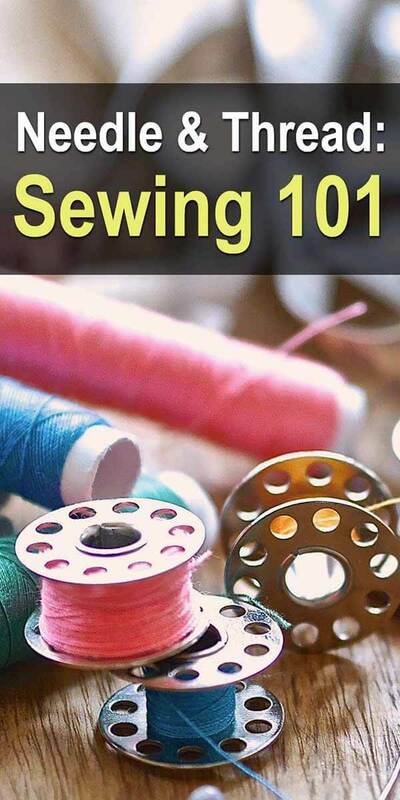 Like thread, there are different types of needles for sewing – both by hand and with a sewing machine. What you’ll need depends on what you’re sewing and why. For example, just for hand-sewing, you need sharps, quilting point needles, embroidery needles, and ball point needles to name a few. Start off by buying a basic sewing kit (which usually contains one or two of each) and work your way up from there. Both hand and machine needles have varying thicknesses depending on your needs. Can you tell one type of stitch from the next? Just some examples are basting stitches (which are used to hold cloth in place), running stitches, backstitches, and blanket stitches. See detailed diagrams on what the basic sewing stitches are and what they’re supposed to look like on Sew4Home. The same principles that apply to sewing also apply to stitching together a wound in an emergency. (Yes, there are nuances and specific stitches, but there are also emergencies where you need to stitch and be done with it.) The most important things to remember are to clean the wound properly beforehand, make sure you wear gloves, and sterilize the tools you plan on using. A sewing machine can (and does) save you a lot of time; furthermore, there are some jobs that just can’t be done by hand and will take forever if you try. Invest in a good quality sewing machine. There are portable, fold-up models, industrial models (for denim, plastic, and leather), and home models depending on your needs. When you feel like it’s time to take your sewing to the next level, invest in some next-level sewing tools like this needle threader, a quilting ruler or thimble pads. Need some more time to practice your sewing skills or just need something put together in a pinch? Consider fabric glue for quick fixer-upper jobs or holding fabric together for sewing with a machine. You can find Singer Sew No More glue for less than five bucks on Amazon. Don’t think that the uses for your needle and thread end at sewing. A needle has about as many uses as you can think up for it and thread is about as versatile as duct tape for holding things up or together. Just one example useful for survival is making an improvised compass with a needle, a magnet, and a glass of water. Head to cyberspace for some sewing apps: Try Sewing Pattern Buddy for starters. Are you a sewing veteran with some tips to share or a novice looking for some advice? Get in touch with us using the comments.